Radiant Verge is a Turn-Based Tactical RPG where your movement determines which abilities you can use. You control a group of hackers infiltrating systems in a Sci-fi Virtual Reality. 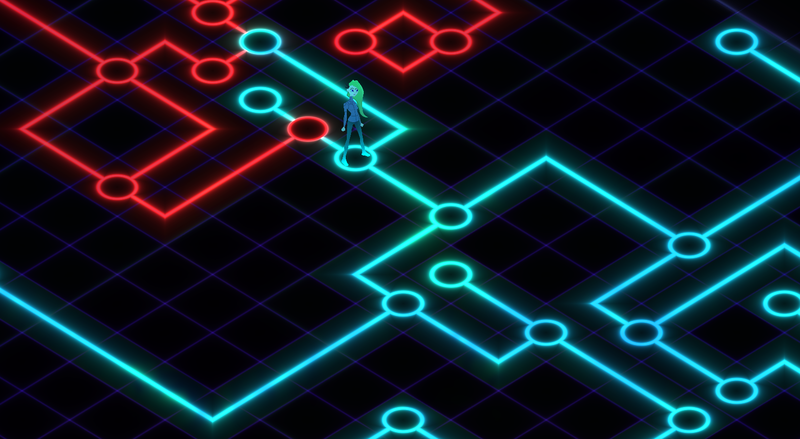 Moving over lines gives you resources matching that lines color, and stopping on Nodes gives you access to special abilities like powerful attacks and scanning abilities that reveal more of the system's nodes and lines. This game is about hacking enemy systems to achieve some goal, like getting top secret information, or bringing down the whole system. Systems have several rooms that you move through, each with their own programs (enemies), and walls or doors blocking your path to restricted areas. Each room also has resource lines of 5 colors which you move along to collect resources so you can use functions (abilities). So you might want to move along the red line collecting red resources, but does this put you in range of the opponent you want to attack? Collecting resources as you move should make for some interesting decisions as you weigh your location against your ability options. Each resource is represented by a color, and has a theme. Red is the resource of Ending programs. Whether you’re doing a close attack, ranged attack, or area of effect, if you are trying to do damage to your enemies, you’ll need red to do it. Red isn’t subtle though. While you can use it to destroy an obstacle in your path, you may raise alarms causing the system you’re in to turn against you. Cyan is about processing power, organization, and is used to alter resources. You use it to manipulate resource lines and generate more resources of other colors. 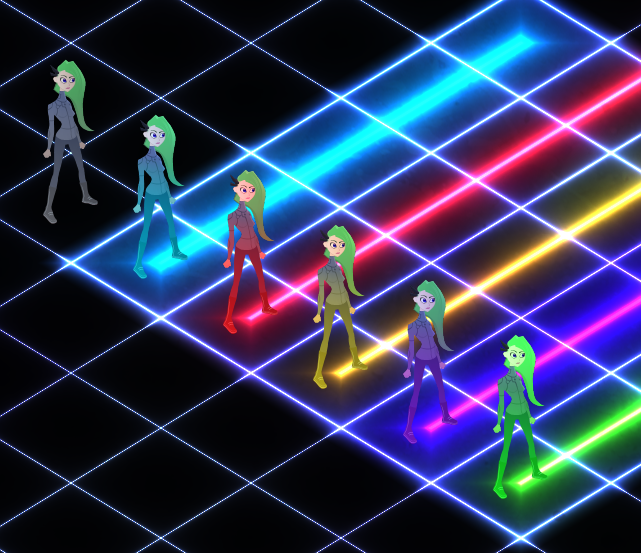 Since you get resources by moving, you can also use cyan to move faster, gathering more resources and putting you exactly where you need to be in the battle area. Yellow is the resource of information. It’s used to scan enemy programs and rooms, locating keys and weak points. It’s also used to see what functions (abilities) enemy programs have. Once you’ve scanned their functions, you may be able to create a copy of that function for yourself, or force the enemy to use that function for you. Which brings us to our next resource. Green represents Creation, Change, and Control. Green allows you to control enemy programs that you have scanned with yellow, using their abilities as your own. Green is also used to modify programs and to create new ones on the battlefield to fight by your side. Purple is the resource of Protection, Stealth, and Restriction. You can stop your opponent from damaging you with armor, stop your opponent from seeing you with cloaking abilities, and stop your opponent from moving by creating walls. You can specialize in one or more resources, focusing on something simple like attacking your enemies, but you can also use all 5 resources for interesting strategic combos. For example, you may scan an enemy program, detecting that it has a cannon. Then withstand a blast from that cannon with purple (or use the purple for stealth so it doesn’t notice you’re there in the first place). Then move several spaces with Cyan to collect red resources. Use green to activate the enemies cannon ability, and the red resources you just picked up to pay for it, forcing the enemy to use it’s cannon on the door, allowing you to get to the next room. 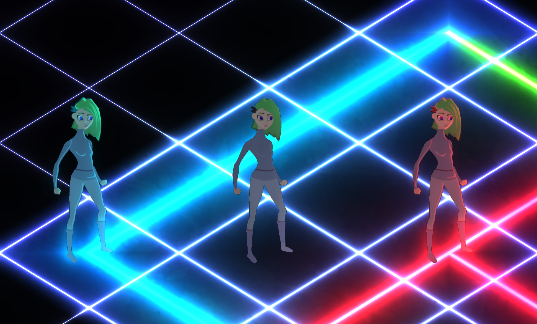 I haven't settled on a visual style yet, but I know I want it to look colorful and glowy. Here's some early concept art. I've been working on some basics, getting characters moving through isometric tiles, path finding around walls and over resources. I still haven't settled on an exact art style. 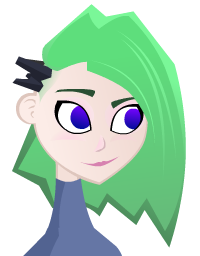 Here's a cartoony vector version of the main character. She's a genetically engineered Empath, so she can alter her own brain waves to match people around her. This ability allows her to quickly learn from others, and take on traits of the other characters on her team. When you choose who to bring on a mission, this also affects the Empath girl's abilities during that mission. The greatest strength of this empathic ability is that it can be used to mimic a computer system that's being invaded. The rest of the hackers have been losing ground in the virtual world as advanced computers include organic brain matter to detect security threats. 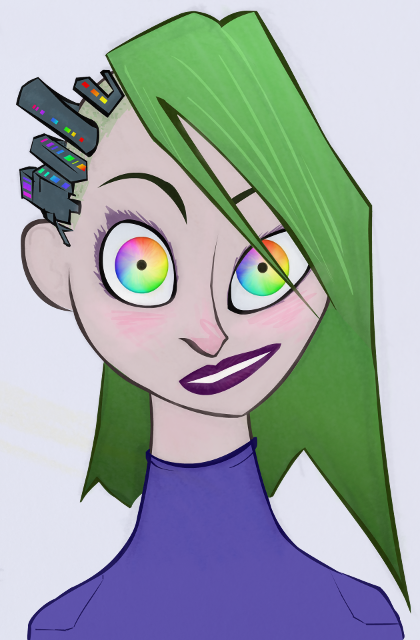 Although the Empath girl is not as experienced with hacking as the rest of her team, she can mimic these bits of brain to get access that the other hackers can't. Here are some small sketches of the team spliced together. Are there any characters you're interested in learning about next? Let me know. Here's a Warhol inspired image, showing off some different blending effects I'm playing with to add texture and color to vector art. I'm thinking about applying textures and blending effects in game, to give the game a unique look. Mars is colonized and lightly terraformed, allowing a genetically engineered race to live on it's surface. While ordinary humans live comfortable lives in domed cities, this martian race lives a harsh life working the land of Mars. Most of this race is engineered to be physically tough to make them better at working the land, but the one on your team is smaller than most. That's just in the physical world, though. In the virtual world, he can be big and powerful. He can take down computer systems that his brothers can't get to in the physical world, no matter how strong they are. Since he can't join the rebellion on the outside, he hacks the corporate systems to take them down from the inside. His primary resources are Red and Green, so his focus is on strong attacks, and constructing weapons and turrets to destroy the system. These tactics make him great for a direct attack. While stealth might not be an option for this hacker, his attacks are great for making a distraction or to buy time for the rest of the team. I'm rethinking his appearance from the earlier version that looks like a Tank character. I think the character will play more as a chaotic force of destruction than as a tank, so a leaner muscle might be a better fit. He may also change shape as he attacks, with muscles growing or stretching as he hacks the system to increase his power. I've been programming the basics of the game, and I found there's a lot with the game design that I was unsure of. I've been bouncing back and forth with ideas, like whether to give players more complete information about the level they enter or to hide information, requiring players to investigate the area to learn what enemies they're facing. Also basic stuff, like whether to give attacks a chance to miss, a range of damage, and/or critical hits. As I work on the design of my game, I'm looking a lot at other Tactical RPGs, including XCOM Enemy Unknown. I've been thinking about the changes they made from the original X-Com, and why they made those changes. They did a lot to simplify the game, while keeping the important strategic decisions. Instead of a large number of action points so the player can count up the points and figure out if they have enough to shoot after they run, the game cuts out the fat and gives the player two action points, one dedicated to movement. Instead of carrying around limited ammo in a complicated inventory, there's a simple reload action which ends your turn so you can't attack. Although I don't think my current design is final, I really like the game I'm coming up with, and hope to be able to show it off soon. Also, here's another character. 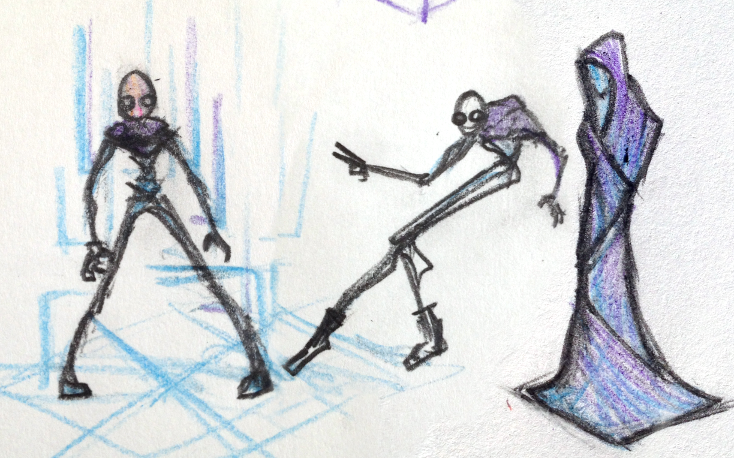 He focuses on Cyan and Purple resources, giving him a specialty in Movement, Resources, and Stealth. When he flips up his hood, it becomes a full cloak, putting him in stealth mode. He doesn't spend any time in the real world now. First, VR Addicts abandon the real world including any belongings or property they have, and live full time with their body in a shelf. This character took that a step further, and got rid of his body. He makes money in the virtual world to pay for a facility to keep his brain alive and to keep his connection with the virtual world strong. Hi, the concept art(rought draws etc...) looks really cool. These characters synopses fortell a highly detailed world. I recently finish playing a FANTASTIC point and click adventure called Technobabylon. Has a lot to do with Wetware, and the telling of virtual reality taking the place of many people's reality (albeit primarily the low class). I really like the Andy Warhol direction, too! Albeit a biased one for fluid animations, if you could get that, combined with an interesting color palette or effect with the vector art, you'd have something unique! In my opinion. Not sure how you would go about that, though. I don't art much. Thanks! I think a lot about my characters and the world, but I don't know for sure how I'll tell the story. Even if it doesn't all get told in the game, I think having background for the world and characters can show. It's an action game that takes place in the same larger setting as this one, but focuses on the dwarf planet Ceres in the asteroid belt. I'm thinking the main character may be another Empath, with the ability to hack enemy systems to take over their weapons. As an action game, I may not focus as much on story as I would with an RPG, but I'll be sure to include a variety of factions with interesting backgrounds like these characters. I've been bouncing between different game ideas for a while, but I'm back to work on this game, and I plan to stick to it. I'm going to try crowdfunding this game next year, and after reading Nathanael Weiss' article, I think it's important to put a priority on proving my game before worrying about finishing it. In part, that means making eye catching visuals and fun looking gameplay to build a following, before trying to add a ton of extra content. I think getting some good visuals will make this DevLog more interesting, so this week I've been learning how to use shaders in gamemaker. 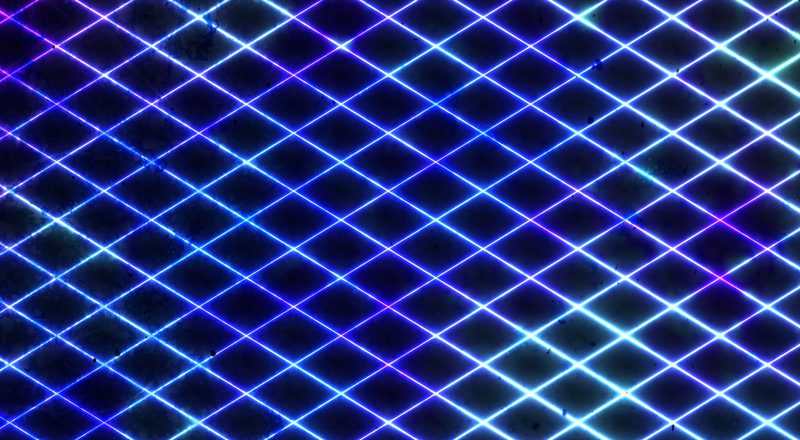 I didn't really know what I'd be able to do with shaders, but I've learned some really neat tricks for blending textures and making glowing effects, that should fit perfectly for a virtual reality setting. 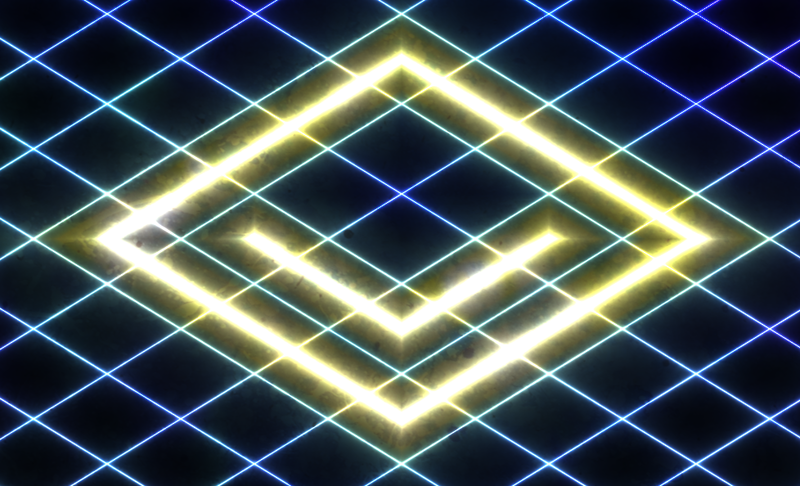 Here's something I've made with shaders that could be what the tiles will look like. 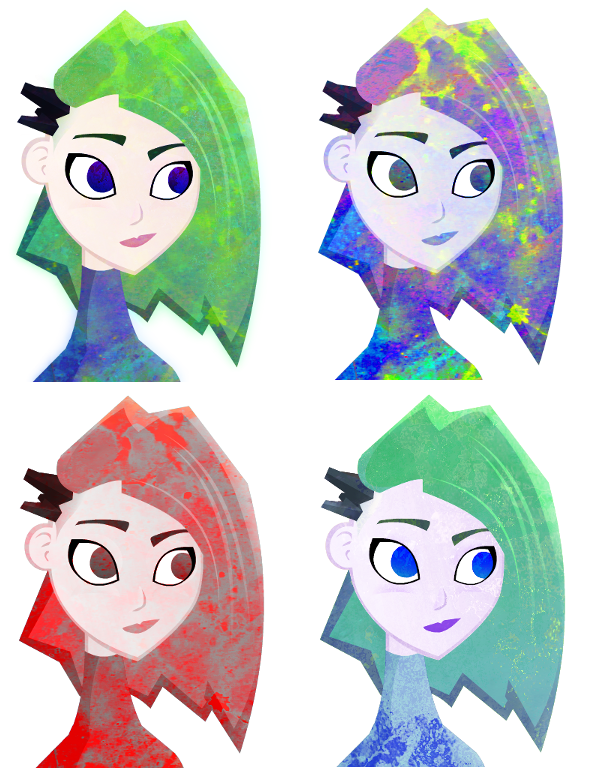 I'll be able to use these techniques to do color changing and texturing of vector art, like shown in my May 26th post. At the time it was an idea done in GIMP or Photoshop, without a clear idea of how it could be done in the game. But with shaders, I'm excited for the possibilities. I'm surprised how much I can throw into this shader without anything slowing down. 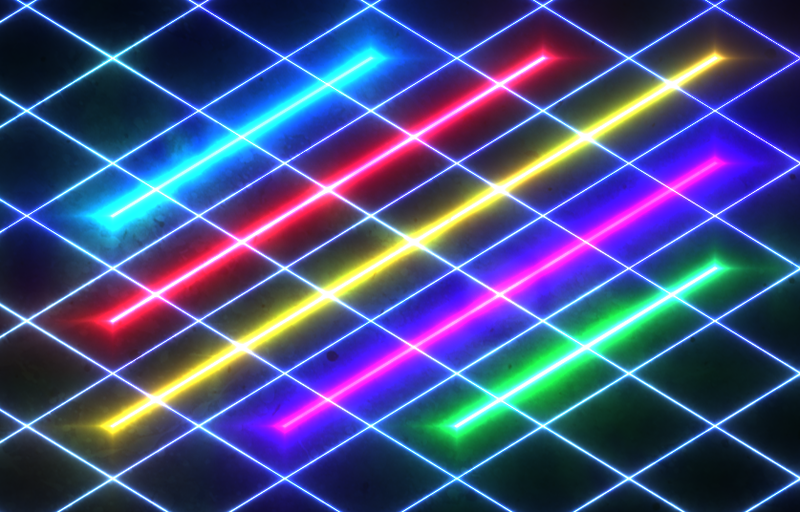 The big glowing lines in this image are Resource lines, which you'll be able to move on to boost your abilities. The lines pick up their color from a blurry image I created (from a photo of eggs), and get some added texture from a splatter painting I made. 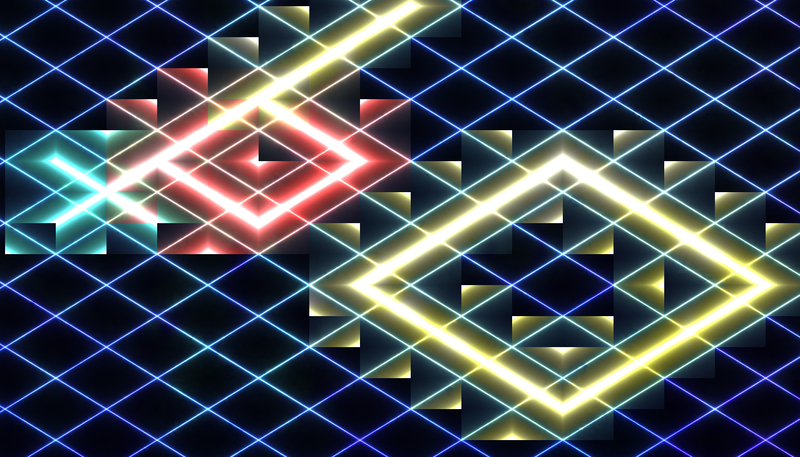 By tiling and animating those images independently, the grid gets an interesting living, pulsing effect. Click the image or this link to see it in motion in html5. You are still working on this! YAY! This week, I hit some snags that slowed me down while adding colors to resource lines. The grid lines I made last week follow a simple mathematical pattern, but the bolder resource lines I'm making have to be placed manually. This means I have to pass a bunch of information to the shader, and have the shader loop through each one. 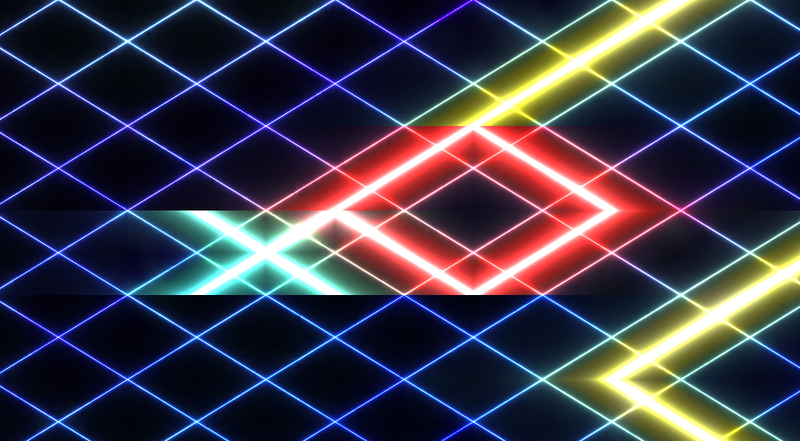 While doing this I got some kind of "unrolling loop" error, because shaders are really picky about how you use loops. While researching this I was told the first step to using loops in a shader is "don't", but if I have to, it might help to make an animal sacrifice. At this point, I was able to give lines a single color, but not multiple colors. For a while, I tried a tile based method of coloring the resource lines. I made a little pixel art map, where each pixel would represent one segment of the resource line. 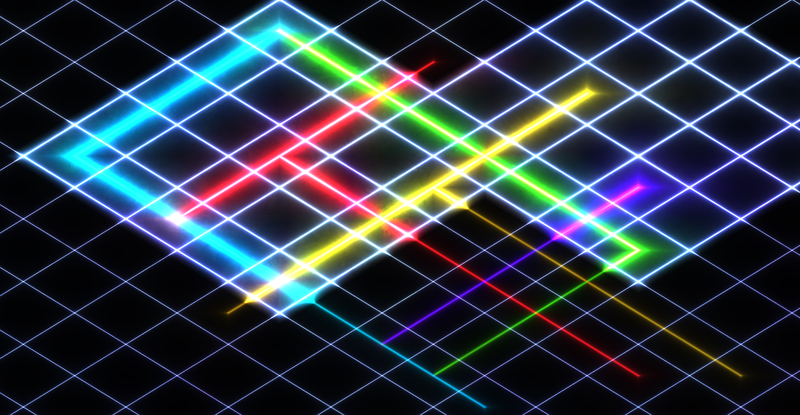 The shader checked each pixel of the map, and made that line segment. I was able to expand the glow horizontally or vertically, but once I started trying both at the same time, I had some interesting results. Again I was getting odd error from the shader; this time it was something about gradients in flow control causing "divergence". I still don't fully understand it. Finally, I realized that a big part of the problem was how I was changing the colors of the resource lines. Instead of just giving them an RGB value, I was doing a different blend mode for each line. Although this could work, it was making the loops more complicated resulting in unnecessary problems. So, I went back to the previous method with some simpler math, and finally got the resource lines working with a variety of colors. 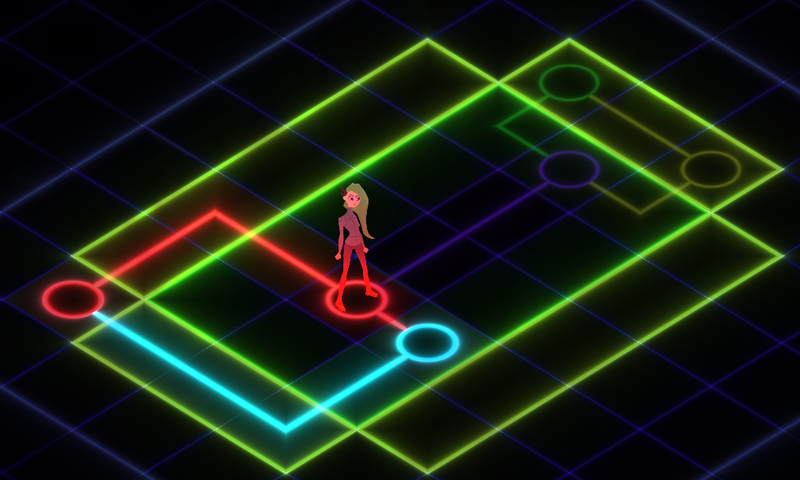 I also plan to include a game-mechanic where you activate sections of the grid, causing resource lines in the active section to light up. Within the active area, you get bonuses by moving on resource lines, and have a 100% hit chance against enemies in that area. Here's what that could look like. 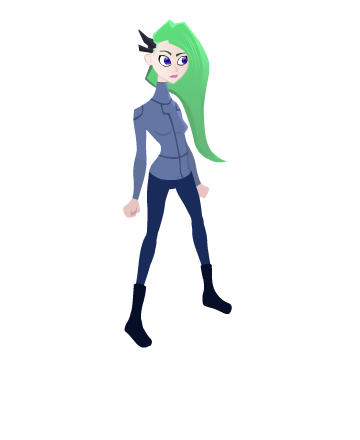 I'm adding color effects to the character now, trying to get the vector art style of the character to fit well with the glowy background. 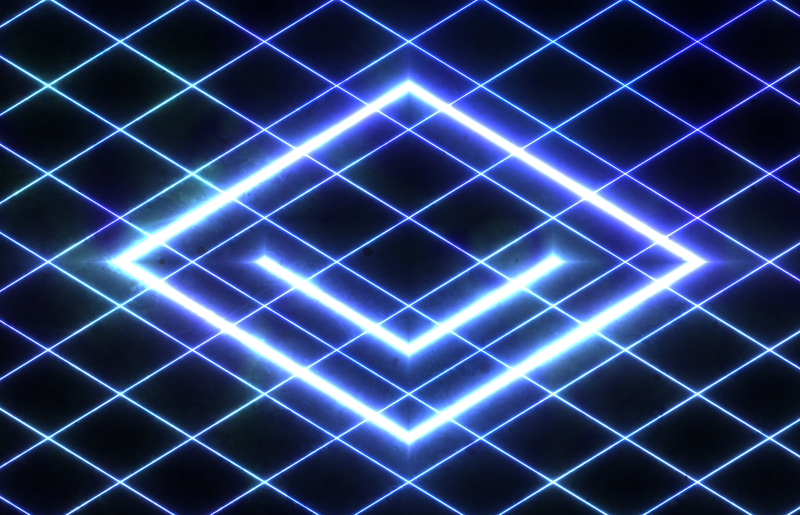 Part of the effect is using the same image that causes the pulsing light effect in the grid lines. 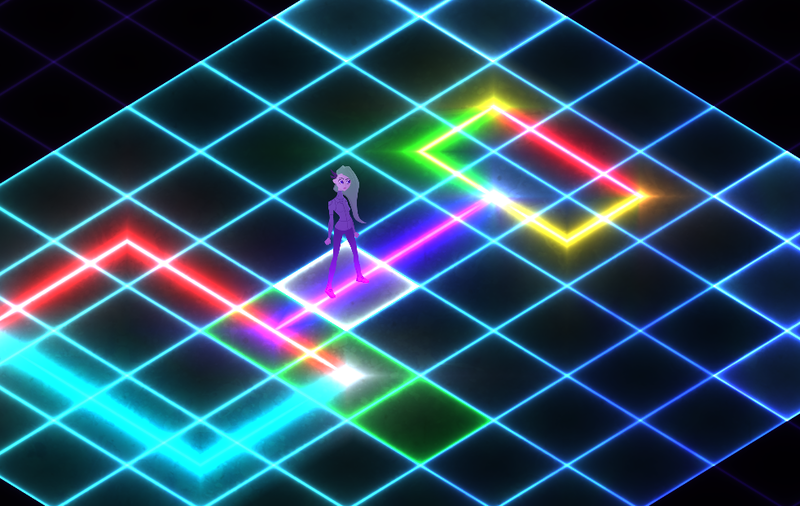 I aligned it with the grid with the idea that the character would light up whenever the tile underneath them is brighter. The effect doesn't work quite as well in motion as I'd like yet, but I'll keep at it. I'm also trying out multiple images for the character, one for the standard color of the character, and one or more for highlights and glow effects. I think I'll try out multiple ways of doing this to see what works best. Here's my first attempt at that. This weekend I'll be doing Ludum Dare, but I'll be back working on this game in a few days. I've been trying to improve my character art. I think for a while I got into some bad habits with my art, accepting a lower quality of art than I'm really capable of. So now that I'm developing the look of the game, I'm reiterating characters, putting more time into the little details, and using more references. So here's this week's version of the main character. I think I need to redo her hands and feet, and maybe add more details to improve the character design. Today I started working on the big guy. Here are a few versions I'm trying out. The light red stuff on the last one would be like glowing holographic horns and armor. 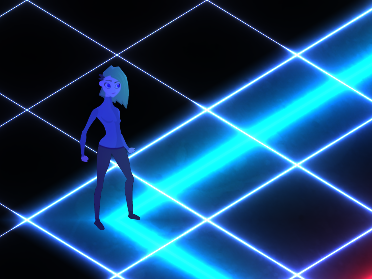 Here's the glow effect I'm using to make the character fit with the glowing background. The light on the character pulses with the light changes in the lines. I'm still trying to find a way to make decent gifs out of it, but with all the color gradients, the gif format doesn't seem to do very well. 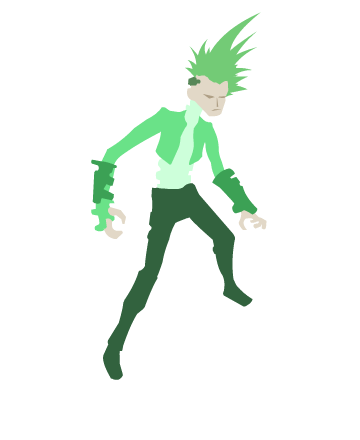 I also started working on some other character silhouettes, plus a few details. They won't stay these colors, but I'm trying to figure out some of the characters details. I think I need to put some more thought into the green guy, to make a more unique character. His character is an expert at making programs, including viruses. I think he may be the leader of the group, but I'm not getting that feeling from the current version. 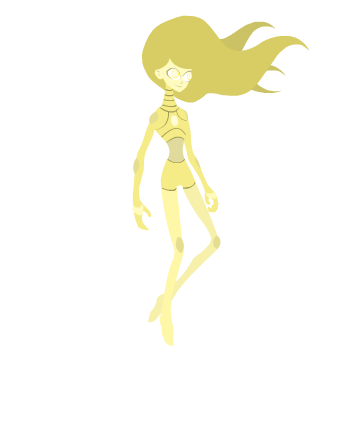 I'm happy with how the floating yellow girl is turning out though. This week I combined the new graphics and shader effects with the tiles, path finding and stuff I made before. Now I'm trying to figure out how to alter the visual effects to communicate useful information. For example, I'll need to show you the tiles your character could move to this turn, and path you would take if you move to the selected tile. There's also a boosted movement range. Some tiles are activated, some are inactive, and others are out of bounds. 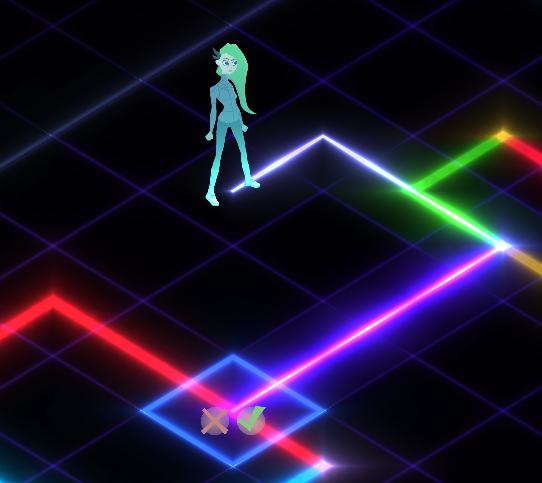 The bright, colorful resource lines show you paths you can move on to boost your abilities. I've programmed that the tiles to have that information, but I'm still trying to figure out how a visual way to clearly communicate that information to the player. By featuring the grid and glowing lights as part of the terrain, when I add more lights it just makes everything compete for attention. Maybe I'll have to prioritize what information needs to be displayed at any given time, switching your vision to different modes as you activate different abilities? This looks interesting, i'm liking the design. Hope to see some more stuff soon. Thanks! I think I'll work on communicating information more clearly with the colorful effects, then try out some effects for the UI. Not to finalize the UI elements, but just to get everything fitting together visually to show what the game could look like. Here's a look at the grid light in motion. I'm still trying to find a gif maker that I really like. I like all the gradients and colors I use are a bit rough with gif makers that don't have a variety of color options. The ones I've found with color options tend to be much more difficult to use, and are missing other basic options. 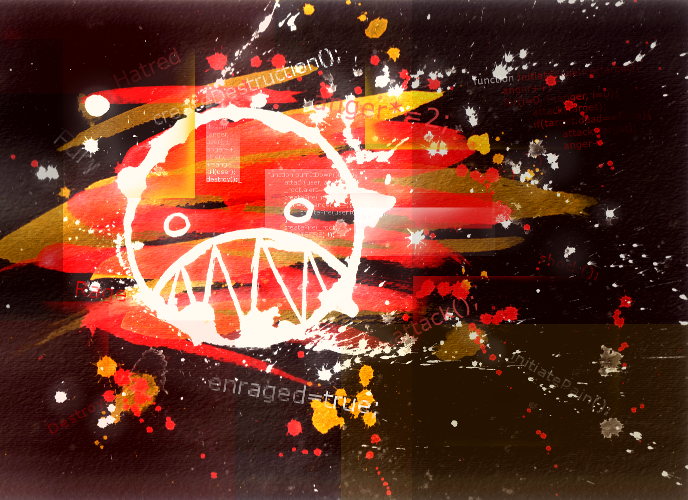 This one was done with Gyazo. It's extremely easy to use by just selecting an area of the screen and watching as it records a few seconds, but has no options aside from selecting an area.